Linville Falls is pretty much incomparable when it comes to size, beauty, accessibility, and photogenic qualities, and thus it is one of the most recognizable and popular in the state. 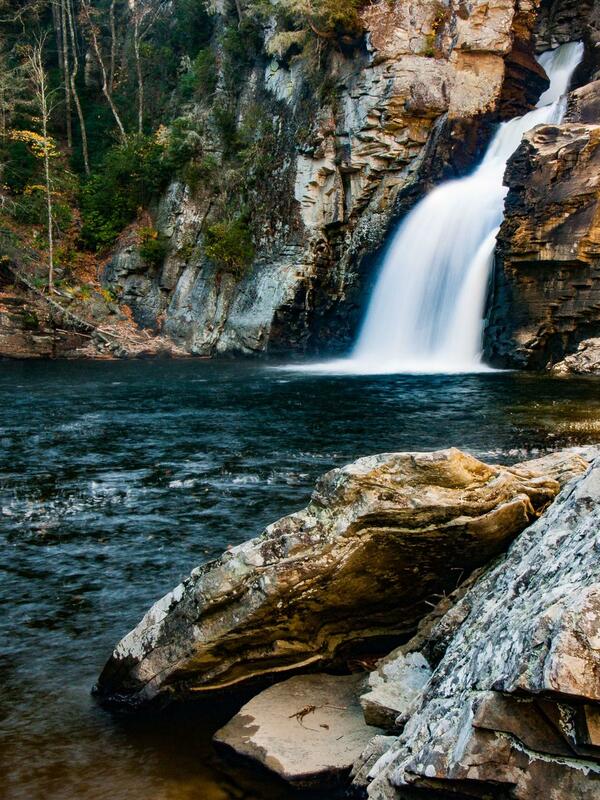 It has the highest water volume of any major falls along the Blue Ridge. Visiting is highly recommended! Hop on the Blue Ridge Parkway and head either north or south to the Linville Falls area at milepost 316.4. From Asheville, it's about 65-70 scenic miles north (depending on where you got on the Parkway), and you'll pass the Craggy Gardens, Mount Mitchell and Crabtree Falls areas. From Boone/Blowing Rock it's about 35-40 miles South and you'll pass Grandfather Mountain. Turn onto Linville Falls Road; go 1.5 miles and park at the visitor center where the hike starts. Note: The section of the Parkway between Asheville and N.C. 80 near Little Switzerland is frequently closed while the section near Linville Falls is still open; there are plenty of places to access the Parkway closer to Linville if this is the case (or if you want a quicker trip). Use your favorite mapping app or site to find the best route from where you'll be. There are several trail options here; some lead to overlooks of the falls and some lead to the base. Hike distances range from about 1/2 to 2 miles, depending on where you start and end. Look at the map and directions at the Visitor Center to find alternate routes. We consider the Plunge Basin view from the base to be the best, so that's what we'll describe here. Turn left before the breezeway at the building and head up the short set of steps leading into the woods and onto the Plunge Basin trail. You'll reach a trail intersection right off the bat. Turn right, uphill, to begin the hike to Linville Falls. The trail will wind around a bit, at one point curving through a side gully with a long rusty pipe partially exposed, and you'll reach a signed intersection with a spur trail to an overlook after about 1/3 mile. If you wish, descend gently on this path down toward the rim of the gorge to a neat overlook above the Plunge Basin, and return. Continue down the Plunge Basin trail. After just a few more feet of climbing, you'll crest a small ridge and start descending. From here to the bottom, the trail gets a bit rougher. You'll descend the cliff band via a long set of steep wooden steps, then the trail turns back to the right, and approaches the river. The trail proceeds upriver on the right side about 100 yards to the plunge pool, and the best view of the main drop of Linville Falls. If the river is very high, this section will be flooded and impassable.